Laura Mazur is a business writer and partner in Writers 4 Management, a professional writing firm. She has been a business journalist since 1978 and was editor of the UK’s Marketing magazine from 1986 to 1989. She has written for a range of publications, including a weekly column for Marketing magazine for five years, and is also the author of management guides on international marketing and communications published by the Economist Intelligence Unit and Financial Times Reports. Since they formed Writers 4 Management in 2004, she and her business partner, Louella Miles, have worked with a range of organizations and individuals, including writing white papers, running writing training courses, and acting as ghost writers/editors on a number of books. An economics graduate of Smith College in the USA, she also has an MA from the University of London in Soviet studies. Louella Miles is a business writer, and Laura’s partner in Writers 4 Management. She started in consumer journalism in 1976, with the Consumers’ Association, before moving over to business writing in 1980. She was managing editor of Marketing magazine through the mid to late 1980s. Her portfolio includes management reports on topics as diverse as corporate reputation and sponsorship, published by Management Today and International Marketing Reports respectively. She has also, for the past seven years, edited a weekly media newsletter, and produces a range of titles on qualitative research. 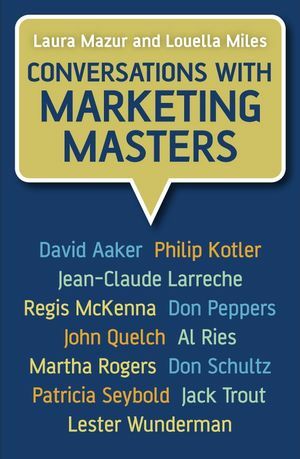 1 Philip Kotler: The founding father. 2 David Aaker: Brand equity trailblazer. 3 Jean-Claude Larreche: Marketing strategy master. 4 Regis McKenna: The technology visionary. 5 Don Peppers and Martha Rogers: The one-to-one gurus. 6 John Quelch: Global marketing authority. 7 Al Ries: Pioneer of positioning. 8 Don Schultz: Integrated marketing communications innovator. 9 Patricia Seybold: Customer experience expert. 10 Jack Trout: Positioning pioneer. 11 Lester Wunderman: Direct marketing missionary.